A new Kickstarter-style website is looking to build support for a challenge to the indicted congressman in a test case for crowdfunding in lower-level campaigns. Despite his indictment in a federal racketeering case, longtime Democratic Rep. Chaka Fattah has said he’s staying put in his district. The architects behind a political crowdfunding website want to make him fight for it. The organization, Crowdpac, has pitched 19 potential challengers for the race, with the aim of stirring up political competition in Fattah’s Democratic stronghold of a district in Philadelphia. 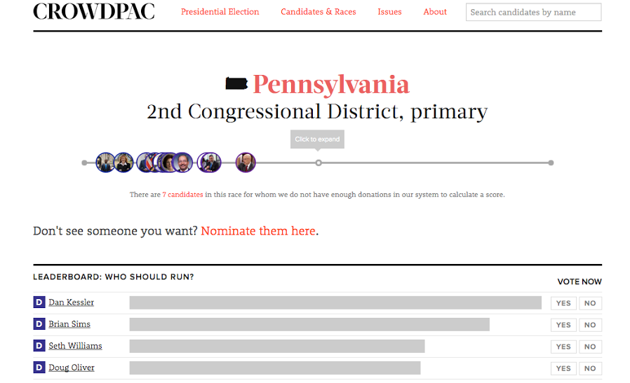 Crowdpac allows voters and donors to suggest candidates for office and pledge funds to them; if the candidates decide to launch official campaigns, Crowdpac then routes the money to them. Given Fattah’s legal troubles and Philadelphia’s strong political structure, the group saw Pennsylvania’s 2nd District as a prime market to test its model and show prospective candidates that support exists for them to run. But even against a congressman under indictment, challengers face a distinctly uphill climb here, raising questions about how effective crowdfunding websites can be at pushing political change—especially in lower-level races where attention levels, and the fundraising that comes with it, can be very low. Crowdpac maintains that its focus is on attracting people to the political process and boosting the power of small donors. Liz Jaff, the group’s political director, disputed the idea that it would take big money to unseat a political veteran like Fattah. In late July, the Justice Department charged Fattah with 29 criminal counts including racketeering, bribery, mail fraud, money laundering, and falsifying records, the result of a long-running criminal probe dating back to Fattah’s unsuccessful 2007 run for mayor of Philadelphia. His trial is scheduled to begin next year, one week after the Pennsylvania primary. Several other alleged associates have also been indicted, including Fattah’s son, who is facing separate fraud charges. Fattah has denied any wrongdoing and has asked a pair of House committees to investigate possible prosecutorial misconduct. So far, Fattah has drawn one Democratic challenger, Dan Muroff, a white attorney and ward leader in Philadelphia. But Democrats say Fattah, an African-American, retains strong electoral advantages in the majority-minority district, which is 59 percent black. Muroff said support via Crowdpac wasn’t the sole factor inspiring his campaign, but it served as an encouraging sign ahead of a tough primary against an incumbent. “The validation certainly gives you more confidence,” Muroff said. Yet many of the black Democrats who have the same base as Fattah—such as state Sen. Vincent Hughes, Philadelphia City Council president Darrell Clarke, and Philadelphia Mayor Michael Nutter—continue to back the congressman. And party leaders haven’t called for Fattah, a senior member of the Appropriations Committee, to step down. “You really need to have a compelling reason to unseat someone who is in that position if they’re representing your community,” said Hughes, who holds Fattah’s old state Senate seat and called Fattah a friend. One of Crowdpac’s goals is to boost people in the political process who otherwise wouldn’t envision themselves as viable contenders. If potential candidates see they have support through pledges, the group’s thinking goes, they may be more inclined to challenge Fattah. Some other potential challengers listed by Crowdpac are state Rep. Brian Sims, District Attorney Seth Williams, and former mayoral candidate Doug Oliver, all Democrats. Kimberly Railey is an editorial fellow for National Journal Hotline. Prior to joining National Journal, she covered Congress at the Washington bureau of The Dallas Morning News. She has also written for The Boston Globe, USA TODAY, and The Christian Science Monitor. Originally from South Florida, she graduated from the Medill School of Journalism at Northwestern University, where she served as managing editor of The Daily Northwestern.